After years of dedicated use, most transportation equipment suffers the same fate: rust, plus unnecessary and costly replacements. Iron oxide, or rust, coats over gears, wiring, hinges, and wheels, making them virtually unusable. Fortunately HinderRUST breathes new life into transit machinery like autos, subways, buses, trains and planes, saving them from the junkyard and saving you money in your pocket. 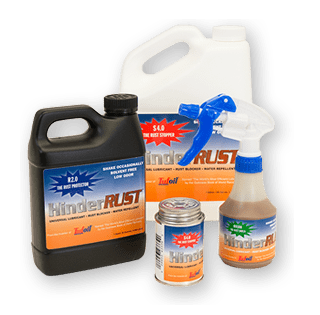 While HinderRUST is ideal for vehicle undercoating applications, its unique ability to penetrate existing rust, adhere and absorbs into metal pores, seal out corrosion and remain flexible and self-healing makes it perfect for other transportation related uses. Freeing-up seized, rusted, corrode or otherwise frozen bearings, bushings, rollers and fasteners.